Our toddler program provides a safe, fun, and nurturing learning environment for toddlers. Here at our Childcare Center in Irvine, California, your little one will be able to enjoy a healthy balance of learning and social activities, music and movement, and outdoor activities. 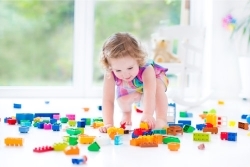 It is our duty to help your child reach their developmental milestones through exploring and learning through play using blocks and puzzles, arts and crafts, and imaginary play. Our teachers also read books to them every day through circle time. We read stories and sing songs which encourages language skills to your kid. In addition, your little one will be able to practice proper hygiene and self-discipline such as hand washing, putting on/taking off their own socks and shoes, wearing coats, picking up their toys, and sharing with friends. Rest assured that we will be able to help them experience a healthy socialization through participating in various activities which are designed to strengthen their gross motor skills, such as balancing, bouncing, catching, and standing on tip-toes; as well as fine motor skills such as drawing, painting, and coloring. Lastly, your child will be also exploring through play and gain self-confidence, learn problem-solving, and self-awareness in a safe environment with adult guided participation in our Preschool Program in Irvine.